Is there anything little boys seem to be more fascinated by than construction? For that matter, there are plenty of little girls and adults who think construction equipment is fun! For you or the child in your life who loves construction, there’s no better toy than a remote-controlled excavator. Not all RC construction toys are created equal! Some of them are pieces of junk that won’t last. I’ve done the research and tried them out and now you can benefit. I’ve compiled this list of the 10 best RC excavators to help you find the right one. 11.1 Where can I find a Gas powered RC Construction toy? 11.2 How much do they cost? 11.3 Can they really dig and dump soil? 11.4 Do they have real working hydraulics? 11.5 I want a solid, metal remote controlled construction toy. 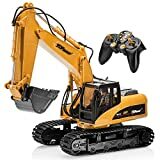 As of this writing, this RC excavator has one of the highest Amazon star ratings. It is a very high-quality toy at a reasonable price, so it offers a lot of value. Something that makes this excavator stand out is that it includes three different replaceable tools. In addition to the standard shovel for digging, there are also tools for drilling and grasping. A small basketball is even included for use with the grasping tool. This toy works just like the real thing. The cab can be rotated 680 degrees and it can move forward, backward, left, and right. It has flashing lights and sound effects but there is a mute button to turn the sounds off. The rechargeable 800mAh battery lasts a long time. The 2.4Ghz transmitter has a range of up to 80 feet. Solid construction is another advantage of this toy which is made from durable plastic and heavy duty steel. It will stand up to heavy-duty play over time. Verdict: This excavator toy is highly reviewed for a reason. 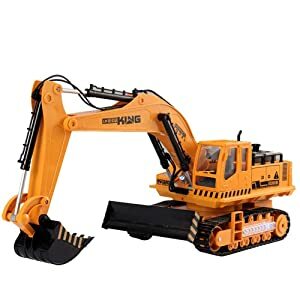 With its solid construction, reliable performance, and three different functions, the Double E 17-Channel 3-in-1 RC Excavator Toy is definitely the best toy for the price. This RC excavator toy has an incredible level of detail. It is a replica of the real thing and you’ll notice lots of small details that you don’t see on most excavator toys. This is even down to the Top logo on the side which purposefully looks like Caterpillar’s Cat logo. It can dig in any direction with its three powerful motors and its heavy-duty steel shovel. A heavy load isn’t a problem and you can easily carry loads of dirt from one location to another. The excavator moves in all directions and the cab has a 680-degree rotation. Transmission is excellent with the powerful 2.4ghz transmitter. You can operate the excavator at a distance of 100 feet or even further away! The engine is powered by a 7.2v 400Mah rechargeable battery and the transmitter takes 2 AA batteries. Unfortunately, the battery takes a while to charge and you’ll only get 20 minutes of playtime on a full charge. Verdict: If you’re looking for an RC excavator toy with realistic details and high-quality performance that can withstand serious play, the Top Race 15-Channel Full Functional Remote Control Excavator Construction Tractor fits the bill. 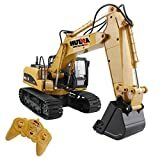 This RC excavator toy stands out for also including a mini-bulldozer shovel. This makes it two toys in one. The remote has 11 functions and it also includes a demo function that controls the excavator for you so that you can see what it can do. What it can do is move in every direction, rotate the cab 680°, and control both the bucket arm and the bulldozer shovel. This toy includes lights and sound although the lights look a little bit too much like a kid’s toy. The cab and the side of the cab above the tracks feature in-your-face colorful lights. These lights might be off-putting for some. The construction of this toy is just okay. It’s made from cheap plastic so it’s not nearly as durable as some other models. Verdict: The WolVol 11-Channel Big Electric RC Remote Control Excavator is fun just for its mini-bulldozer function but it does come with problems. For the price, it’s decent but this one is buyer beware. To help a child practice and develop their hand-eye coordination, an RC excavator toy is a fun solution. This RC excavator is definitely up to the task. The three different sections of the arm and the shovel can lift up and down. Each joint, including the bucket, can operate independently. It can move left, right, forwards, and backward. The cab rotates 680 degrees and there is 360-degree Pivot Steering. Using the remote to control all of this takes some practice but it can be very good for developing a child’s skills in ways that will transfer over to real-life applications. The remote has a 10-100M range. 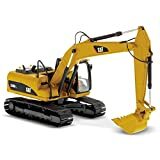 This excavator has a number of realistic details and it features working lights and sound effects. Unfortunately, this is yet another RC toy that doesn’t have the best battery life, only giving you 15-30 minutes of play time on a full charge. Verdict: This Fisca RC Excavator Toy is a moderately priced, perfectly decent toy that stands out for its excellent RC transmission range. As of this writing, this RC excavator has one of the highest Amazon star ratings. It is a very high-quality toy at a reasonable price, so it offers a lot of value. Something that makes this excavator stand out is that it includes three different replaceable tools. In addition to the standard shovel for digging, there are also tools for drilling and grasping. It can also move in all directions and the cab rotates 360-degrees. In addition, there are lights and sound effects to help further the imaginative experience. Verdict: The all-plastic PowerLead Ptco T009 RC Excavator might look a bit cheap, but it’s a well-made toy that can handle rough play. This is a good option for a younger child. Not every RC excavator toy is a good fit for young children. This is one that can be enjoyed by younger kids, even as young as three years old. The remote is simplified and designed to fit young hands. There are lights and sounds and even stickers included so that the child has some control over the ultimate design of the toy. The cab features some colorful crystal-like material to add another layer detail to attract the eye. With the remote, you can navigate the excavator forwards, backward, left, or right. You can also move the arm up and down and rotate the cab 680°. Verdict: The Think Gizmos Remote Control Toy Excavator Construction Vehicle TG643 comes with a number of problems but it might be a good choice for a creative kid, especially a younger one. This RC excavator toy from Top Race offers a lot of value at a very affordable price. It’s similar to the Top Race 15-channel model but not quite as good. It has a good attention to detail with a number of small touches that make it really look like the real thing. The functionality is also realistic, with the ability to move in all directions, lights and sounds, a cab that rotates 680°, and more. The motion of the bucket is pre-set, so you can’t independently control each joint on this excavator like you can with some others. The remote control is simpler than what you’ll see for many RC excavators, making it a good option for younger kids. Like many RC excavator toys, the battery life isn’t great but the battery does charge much faster than other models. Verdict: Top Race 7-Channel Full Functional RC Excavator is a budget option that obviously comes with some drawbacks but it is a decent toy with some very positive features. If you don’t want to spend a lot, this excavator toy is worth looking at. For a very reasonable price, it offers rugged durability and loads of fun. The RC transmitter is designed to fit well in a child’s hands. The 7-channel receiver has good range and will work well both outside and inside. Playing with this construction toy can help with motor and sensory development. The excavator turret rotates 360 degrees and the vehicle moves in a unidirectional pattern. In addition, there are fun lights and sound effects to help further the experience of imaginative play. To power this toy, the engine uses a rechargeable LiPo battery and the transmitter uses 3 AAA batteries. Verdict: You get what you pay for with the Toydaloo Remote Control Excavator Toy Truck. It’s a decent model for a very good price that gets the job done but isn’t as good as other models. When it comes to the real thing, Caterpillar is the leading brand. This high-quality metal model is an exact replica of a real excavator. Despite it being a model and a toy, you’ll see the same attention to detail and high-quality craftsmanship. Unfortunately, this excavator does not have a remote control. That said, it does feature some functionality. The body rotates 360 degrees on chassis, it sits on movable tracks, and the boom, stick and bucket are all movable. This excavator model has just as much detail on the interior as the exterior, making it a collector’s dream. It also comes in a nice collectible metal box with photos and specifications of the real machine. Verdict: Although it doesn’t have a remote or any power, the Caterpillar 320D L Hydraulic Excavator Core Classics Series Vehicle is a high-quality, beautifully detailed toy that will stand the test of time. It’s perfect for collectors but it also is great for play. 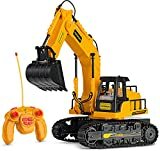 This is another Caterpillar excavator toy that unfortunately does not have a remote control. Nonetheless, it offers excellent realism and nice functionality. A replica of the 568 GF Road Builder excavator, this excavator is made for the serious heavy-duty work of building roads. This can easily transfer over to imaginative play. The model features tiltable cab as well as a movable boom, stick, and bucket. It moves on the metal tracks and rotates 360°. It screams authenticity in every little detail, from that classic Caterpillar yellow and the Cat logos to the realistic details both inside the cab and out including hoses and grab rails. This die-cast metal and plastic toy is well-made and is quite durable. For the collector, this comes in a nice metal collector’s box. You also get photos and specifications for the real machine this toy is modeled after. Verdict: For the collector, it’s hard to do better than the Caterpillar 568 GF Road Builder High Line Series Vehicle. That said, the lack of remote or power might make it only a secondary choice when looking for a toy for active, imaginative play. Where can I find a Gas powered RC Construction toy? Although there are some good gas-powered RC cars and trucks out there, there really aren’t many gas-powered RC construction toys. For the ones that do exist, you can exist to drop a significant wad of cash to get your hands on one. It’s understandable why you would want a gas-powered RC toy since the battery life on even the good ones is so poor. Converting a battery-operated RC toy to a gas-powered RC toy is a project that a serious hobbyist with some training in that kind of work could take on but right now, there aren’t many options to purchase them outright. Like with any product, there is a wide range of price points for remote control excavators. Generally, you’ll see them within $20-100 although you will see some outliers on either side. The RC toys at the lower end of the price spectrum often come with some challenges or deficiencies but most mid to high-range models will be of a high quality. 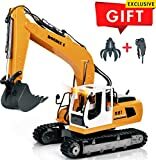 All of the RC excavators on this list have something to offer, even the cheaper ones. If you want your RC excavator to last, though, I’d recommend going for at least a mid-range price. If this is a toy you want you or your child to enjoy over time, it’s worth the extra investment up front. Can they really dig and dump soil? In theory, all of these RC excavators can dig and dump soil. In actuality, some of them can only kind of do the job while others excel at it. The best excavators for really digging and dumping soil are the Double E 17-Channel 3-in-1 RC Excavator Toy and the Top Race 15-Channel Full Functional Remote Control Excavator Construction Tractor. Even the cheaper models can handle digging and dumping really light materials but to dig and dump soil, you’ll want to invest in one of the nicer models. Do they have real working hydraulics? Although some of these construction toys are modeled on excavators that use hydraulics, none of these have real working hydraulics. There are RC excavators with real working hydraulics but they typically cost several thousand dollars. I want a solid, metal remote controlled construction toy. For a solid metal construction toy, your best best is one of the Caterpillar die-cast models. Unfortunately, these don’t have a remote control. The Top Race 15-Channel Full Functional Remote Control Excavator Construction Tractor and the Double E 17-Channel 3-in-1 RC Excavator Toy are examples of remote controlled construction toys made from a combination of solid metal and high-quality plastic. Which one of these RC excavators do you have your eye on? Did I miss a good one that should be on this list? Let me know in the comments! Does any of the top 2 or 3 models have a drive to electric wall plug and plug the connection to model without removing batteries and so forth?